No one likes being accused of being a “conspiracy theorist.” It’s an offending and dismissing label which basically sends the message: “I think you’re an idiot or a crack pot.” It’s the quickest way to lose a friend, or have them stop talking to you about the things they find important. In essence, they will shut you out after you have tried shutting them up. It’s a no-win situation for both parties. Wikipedia defines “conspiracy theory” as “an explanatory proposition that accuses two or more persons or group, or an organization, of having caused or covered up, through secret planning and deliberate action, an illegal or harmful event or situation.” According to author and political scientist, Lance deHaven-Smith, this term was invented and came into wide circulation by the CIA to smear and defame people questioning the JFK assassination. It’s been used ever since, much like President George W. Bush used the term “unpatriotic” for those who questioned the necessity of the Iraq War. Let’s face it, many once called “conspiracy theories” have turned out to be correct, especially where the government was involved. Let me list a few of the more famous cover-ups: Prism, the NSA’s domestic surveillance program (includes spying on everyone, even our allies); Project Paper Clip (allowing illegal entry of famous Nazi scientists and collaborators into the U.S for profit); the Tuskegee Syphilis Experiment on Afro-Americans; Project MKUltra Mind Control Program; COINTELPRO by the FBI—and the list goes on and on. Our government and others simply do not tell us everything—especially if it is illegal, unethical or immoral. Obama promised us complete transparency in his presidential campaign, yet the secrets seem to have gotten worse. Is it any wonder why more people are becoming “conspiracy theorists.” All we want is the TRUTH. Cover-ups are a conspiracy against the American people. Which reminds me…if something is already proven, why do we still call it a conspiracy “theory”? It’s been my experience that conspiracy theorists generally ask questions when not all the facts add up. They don’t take everything they read in the news or watch on TV as the gospel truth. They know they have been deceived before and prefer to dig deeper. They tend to think of themselves as more critical thinkers. They know that pertinent information is oftentimes conveniently left out. In fact, a 2013 study by psychologists Michael J. Wood and Karen Douglas of the University of Kent in the UK, suggests that those labeled “conspiracy theorists,” actually appear to be saner than those who accept the official version of contested events. They were surprised to discover that it is now more conventional to believe so-called conspiracy comments than conventional ones. They also found that “anti-conspiracy” believers (especially with regard to 911) often displayed anger and hostility when trying to persuade the conspiracy theorists that they were wrong. Wood and Douglas found that the negative stereotype of the conspiracy theorist—as a hostile fanatic wedded to the truth of their own fringe theory—instead more accurately describes the people who defend the official account of 911, not those who dispute it. I don’t know about you, but this definitely gives one food for thought. But, here’s the real dilemma. The sad thing about being labeled a conspiracy theorist is that you often have to put friends into “safe” conversation groups. I heard two friends recently complain how they can’t discuss spirituality with a certain friend or family member, oftentimes avoid politics with another friend, and are very selective about mentioning ET and/or UFO stories altogether. The categorization process becomes complicated. You have to remember which topics you can or cannot talk about with which people. I myself know I can’t talk about a lot of my interests with my sister, while my brother is totally cool with some pretty off-the-wall stuff. My bicycling buddy, a Republican in a sea of Democratic friends, also added her own frustration with being labeled a “Republican” in the great “blue” State of California. “I believe in gay rights, abortion, and a lot of stuff other Republicans don’t!” she complained. Obviously, she also hates negative labeling. Yet, the truth is we tend to label when other people’s beliefs make us uncomfortable, or worse yet—threaten deeply held values. Over the years I have learned it’s always better to say “that’s interesting,” when I don’t agree with someone else’s point-of-view. That’s especially true if I want to avoid a heated debate. Sometimes I just listen and say nothing, even though I might have to lacerate my tongue to do so. On the other hand, I’m sure my beliefs don’t always make others feel comfortable either. 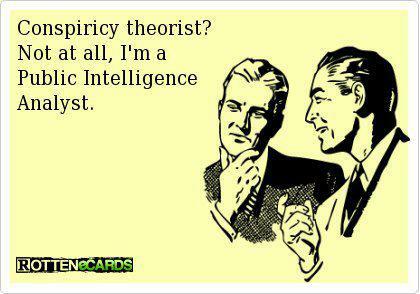 But I must confess–I like people who question the “official story” even if they are conspiracy theorists. It tells me their brain cells are robust and no where near atrophy. If you like this article, please subscribe to my free weekly blog on this website. Thank you. Hello Kathy, I only caught on to your Blogs shortly. So I´m reading them now by and by. So I don´t know, if you will read this comment. But I´ll try. Your Blog on Conspiray theorists really made me feel good. Now this: Until about two months ago I didn´t really believe in chemtrails, didn´t want to know anything about them and thought, that was an exaggeration. and then it happened, that more and more often when the sky was clear I found the sunlight somehow cool and milky, not as I used to see it. So I did some research in the Internet and i was convinced, there is something happening, that is not ok. And then i could observe, that often many days ina row the sky above my northern German home was striped in all directions, planes criss croissing in a way, that was not normal. Those were not regular Airline far distant flights. So now I´m in the box again, the box with the conspiracy theorists. (I´m also in it because of 9/11) I wrote to Greenpeace, their answer was, if those stripes were dangerous, they would have taken care of that subject. So I wrote back, asking if they could tell me then, of waht those stripes consist. The answer is still to come. Now my question to you Kathy, what is your opinion on Chemtrails? I read, that in the USA they already spray since the 90s and in Europe since 2003..The Goal is to block off the sunlight and slow down global warming. But with what??? If the stripes do contain aluminum, it could be an explanation for the increase of dementia at a fairly young age. But of course that could also have many other reasons. I would love to hear from you to this subject. Many of us “conspiracy theorists” are coming out of the closet to more openly challenge what we see happening all around us. More and more people are questioning what kind of insane planet has Earth become where it is bent on destroying its own. I believe it had to get to this overt stage to finally awaken the human race. This awakening is part of the spiritual evolutionary process, so it serves its purpose. When it was covert it could be easily dismissed, not anymore. These are powerful times. Lives Between Lives Why did TSA put an RFID tracker chip in my carry-on?